The Eurocopter Tiger is a four-bladed, twin-engined attack helicopter which first entered service in 2003. It is manufactured by Eurocopter, the successor company to Aérospatiale's and Daimler-Benz Aerospace AG's respective helicopter divisions, who designate it as the EC 665. In Germany it is known as the Tiger; in France and Spain it is called the Tigre. Development of the Tiger had started during the Cold War, it was initially intended as an anti tank helicopter platform to be used against a Soviet ground invasion of Western Europe. 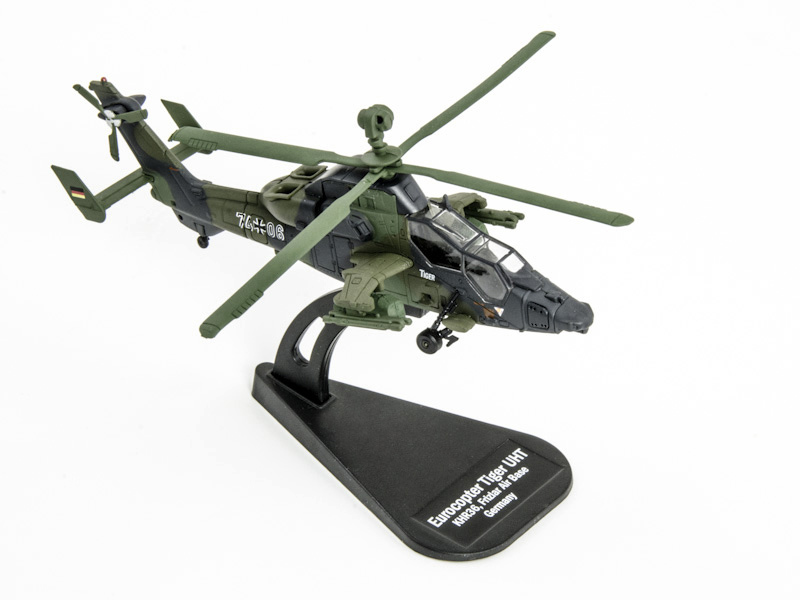 Due to a prolonged development period during which the Soviet Union was peacefully dissolved, France and Germany chose to proceed with the Tiger, developing it as a multirole attack helicopter instead, achieving operational readiness in 2008. The Tiger has the distinction of being the first all-composite helicopter developed in Europe; and incorporates other advanced features such as a glass cockpit, stealth technology and high agility in order to increase its survivability. Improved variants have also begun to enter service, outfitted with more powerful engines and compatible with a wider range of weapons. Since the type's introduction to service, Tigers have been used in combat in Afghanistan, Libya, and Mali. 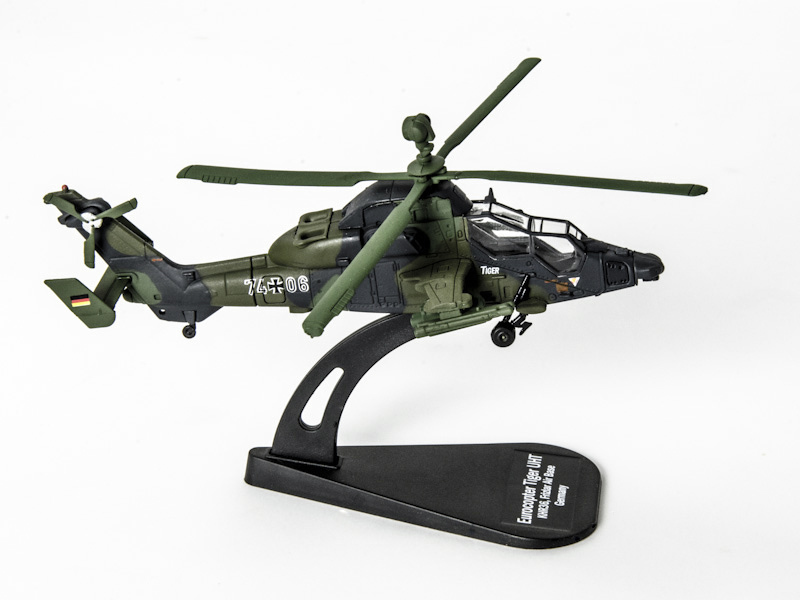 Tiger UHT of the German Army The UHT (from Unterstützungshubschrauber Tiger German for Support Helicopter Tiger) is a medium-weight multi-role fire support helicopter built for the Bundeswehr (German Armed Forces). Under an agreement between the German government and Eurocopter made in March 2013, a total of 57 Tiger UHs are to be procured. The UHT can carry PARS 3 LR "fire and forget" and/or HOT3 anti-tank missiles as well as 70 mm (2.8 in) Hydra 70 air-to-ground fire support rockets. Four AIM-92 Stinger missiles (2 on each side) are mounted for air-to-air combat. Unlike the HAP/HCP version it has no integrated gun turret, but a 12.7 mm (0.50 in) gunpod can be fitted if needed. The German Army decided against the French 30 mm (1.2 in) GIAT cannon used on other Tiger versions due to dissatisfation with the heavy recoil of this weapon. Another difference is the use of a mast-mounted sight, which has second-generation infrared and CCD TV cameras (range 18 km).